A few years ago I wrote this short post about home schooling. I thought I might expound a little more to help encourage you on your homeschooling journey. It’s not always an easy one, but it really is rewarding. 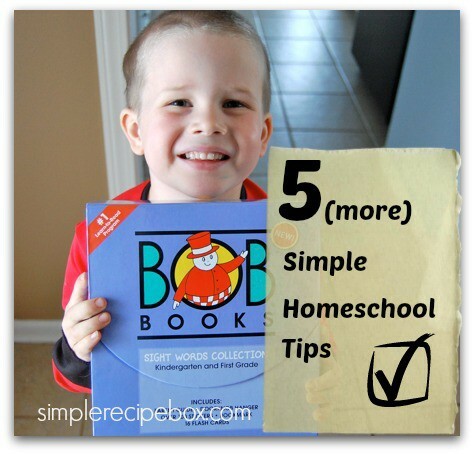 I’ve had a few more thoughts since then, only a few Here are 5 simple homescholing tips that I hope will help make your home school journey a successful one. If one of your main goals is to create in your children a love of learning, that will alter the way you approach schooling. In our nation right now, the measure of “education” is based on test scores. Many classrooms (not all, but many) “teach for the test” attempting to fill the buckets (brains) of the children with information. Instead of filling a bucket, focus on lighting a fire. A child who loves to learn and knows HOW to learn will become a life long learner. That is what you want. Being able to pass a test and subsequently forgetting the information does not produce an “educated” person. Therefore, try not to measure your kids up to the same standards as the public school tests. Find the strengths of your kids and their interests, and let them explore those areas, don’t get too bogged down with busy work. Strong reading skills are key to being a self-motivated, life long learner. What I’m going to say about reading may shock you. Don’t push it too early unless your child is ready, and don’t rush them to meet some certain “standard”. For a lot of kids, reading doesn’t really “click” until 7 or 8. Not every child will be reading at 5, and they don’t have to either. The early years of learning phonics and having a patient instructor help, but what you really want is a reader who also has high comprehension and that can take time. Memorizing a list of sight words leads to lower comprehension later on and the inability to sound out new words phonetically, which will not make for a strong reader. They may be able to “read” a lot of words earlier using this method but it’s not as beneficial as learning phonics. I remember with my first son I was so nervous that he would be “behind” and I couldn’t figure out why it was taking years for him to be a proficient reader. I thought for sure I was messing him up, but I stayed consistent and patient. Do you know what happened? Right around 7 it finally clicked and by his 8th birthday he took off soaring! He began reading AND comprehending 4-5 grade levels above his own. (I know because I tested him) He now comprehends at a 12th grade level, and he’s 12 years old. Stay consistent and patient, but don’t try to rush the process. Each child is different. I have since started school later with each child, instead of starting at 5 I start them at 6, except for one who was ready early and reading at 4. There is not a standard, just stay consistent and pay attention to the needs of each child. Don’t make them feel slow or stupid and never compare, this will make them hate school! There is no reason for doing this in your home school. This is the beauty of home school; you are not bound by the rules of a traditional classroom. Your school can be catered to your child’s needs! One of the best things you can do to foster a love of reading, is to read LIVING books with your kids. Read out loud to them every single day for as long as you can. Read great literature. It sinks in and they learn far more this way. They learn how to write by listening to well written books being read to them. They learn about all different cultures and peoples, places, and religions. Books are a great way to introduce and talk through social issues and problems in a comfortable and safe way. Make reading a big part of your home school and your kids will love reading. When they want to learn something, they will turn to a book. This is a huge win! “The question is not,—how much does the youth know? when he has finished his education—but how much does he care? Most areas have a home school association-a network of home schooling families that support each other. If you are not already a part of one, find the closest one to you and join it! Often there are home school co-ops where your kids can take classes outside of the home and learn from other parents as well. We have loved this for our kids! They get to take classes on things that I don’t have the time to get into, with other kids in a classroom setting. They get to play and interact with their friends every week and it’s a really enjoyable time. Even if the co-op idea isn’t your cup of tea, a home school association can provide information on exciting things happening in your area and new learning opportunities. They often have organized field trips and some even have mentoring programs for new moms. Get support with this new venture! Learn from more seasoned home school moms. Most likely their advice will put you at ease, it has been that way for me. Maybe attending a home school conference is the kind of support you need. Listen, if you’ve never done this before, do you think you can just jump right in without knowing anything about educating a child? I’m not saying you need a certification, in fact that has been shown to be more of a hindrance in many cases, however, you should do some research. Figure out what kind of teaching style you are drawn to, what is your educational vision for your family, what are your goals? Get support from more experienced moms if you need help in this area. You don’t have to be rigid about your schedule, but there ought to be a consistent routine to your day. This should be clearly laid out and defined for your kids so they know what to expect. This will bring peace and order to your home school day. Trust me, the days that I fly by the seat of my pants are hectic and crazy making! Hannah Keeley has some fantastic ideas for scheduling your day that are easy to follow and not too rigid. She is a seasoned home schooling mom of 7, so you can trust her advice. A big part of our schedule is the “quiet time” hour or hour and a half. This happens in the afternoon while the toddlers are sleeping. My 5,7, and 8 year old listen to an audio book or Adventures in Odyssey and they can play with legos, draw, bead, weave-whatever it is they like to do that is quiet. There is no talking allowed or moving about. This is a still, creative time for everyone, including me. This is when I sit down to read or write, have a cup of tea and recharge for the second shift of the day. This would be a time to nap if you are a napper. My oldest is typically still finishing up his schoolwork during this time because his 7th grade work load is heavier than the younger one’s. Nevertheless, this is a relatively peaceful time in the house. I personally do not use this time to clean, I clean after quiet time. I really need some down time at this point in the day so that I can be a calm, loving mommy for the rest of the day. There is no shame in taking this time. Schedule free time. Plan time throughout the day for playing outside, hopefully every day. Being outdoors is really healthy for growing kids minds and bodies and it’s sorely missing these days. I had a friend (also a home school mom) who had the police called on her because her kids were outside playing. These kids were plenty old enough to be playing outside. When the officer came and saw what was happening, he apologized to my friend and told her she was doing a great job and he wished more kids played outside. Try not to have too much going on that there is no time for outdoor play. Your home school gets to look like.. well you. It doesn’t have to look like a classroom, unless you want it to. Maybe that’s what you want and that’s what makes you happy, if so, go for it! But just know that it doesn’t HAVE to look like that. Let your school day ebb and flow with the rhythm of your home and be flexible when things throw you off course a bit. School in our home happens in a variety of places. Mostly at the kitchen table in the main room, sometimes on the couch or floor, sometimes outside, sometimes in the car or the store… it does not look like traditional school, but it works very well. I am still constantly tweaking things to find what I like best and I’ve been doing this for almost a decade! Remember that you are always teaching and your children are always catching, so make sure to capitalize on teachable moments wherever they may occur. Teach math while shopping, review facts while swinging on swings or jumping on the trampoline, recite spelling words while jumping rope… be creative. Make sure you allow for a lot of movement, especially if you have active children or boys. You can let them twirl, twist or bounce while “doing” school. With that being said I will share with you one thing that I’ve brought from school into my house. When I am reading to the kids in a group (hello, there are 6 of them) and there is a question that needs to be answered, I do have them raise their hand and then I choose who gets to answer the question. I do like some order in my home school and I do think it’s wise to teach kids how to wait to speak. I also don’t let them talk over me when I’m teaching. There’s just nothing wrong with that. I know a lot of home school mom’s who don’t agree with this, but that’s the great thing about home school-we get to all do what works in OUR homes. While it is fantastic to ask questions and learn from other mom’s, do not fall into the trap of comparison. Don’t compare your kids with theirs, your books with theirs, your parenting style with theirs, your clothes with theirs… just don’t compare. Learn to love, accept, appreciate, and learn from other mom’s and honorably disagree if needed. Plus, being around a mom who you feel is constantly picking you apart is just no fun, so don’t do that, mmm-kay? It is a beautiful and wonderful thing to be in this journey of motherhood and home schooling with other women. There is so much that can be learned from our differences, but if you are constantly trying to measure up or tear someone else down to make yourself feel better, you will miss all the learning opportunities. I love having friends that parent different than I do and teach differently than I do and it does not threaten me one bit that they are different. Be confident in who you are, and in the fact that God gave you YOUR children because you are the best parent for them, love your children the way they are and fight the monster of comparison.